This release is the second and final new chapter in Shin Getter Robo. It's called "Crater Battle" and is unrelated to the main story (for more details, see this post). As for the rest of Shin Getter Robo, I'll probably just release it as one whole volume now that I've got the entirely new chapters out of the way. There's still a lot of new material throughout the old chapters, so be sure to check it out once I release it. Some kind soul uploaded the OVA adaption of Ken Ishikawa's Kyomu Senshi Miroku (of the Kyomu Senki 「虚無戦記」 manga series). Today, I'm releasing the first new chapter in Shin Getter Robo. It's called "Encounter with the Unknown". Some of you may notice that this chapter was adapted in the OVA, New Getter Robo. I thought I'd release Shin Getter Robo as one complete volume, but I figured since I have some of the new material done, I might as well release it. Included with this new chapter are redone versions of the first two chapters, "Getter Robo vs Getter Robo G" and "A New Conflict". The quality difference between this and the old release is worlds apart. I'll talk a bit about the other new material exclusive to this edition of Shin Getter Robo. The second new chapter, called "Crater Battle" is actually just an extra story at the end of the book. It takes place during the Moon Wars that was the prequel to the OVA Shin Getter Robo Armageddon (Known in Japan as "Shin (Change!) 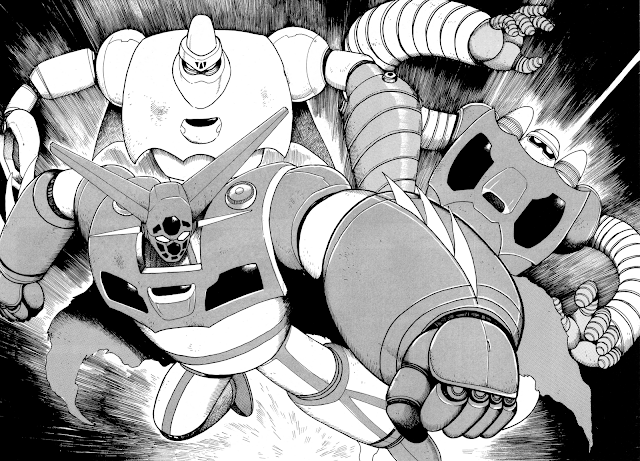 Getter Robo: The Last Day of the World"). It obviously has no bearing on the manga story, but it's a fun read. Translation for it is complete, and I'll start the scanning process probably tomorrow or Monday. The rest of the new content takes the form of additions and alterations to the original Shin Getter chapters. There's over 30 pages of new stuff! It mostly concerns Getter Emperor's scenes.